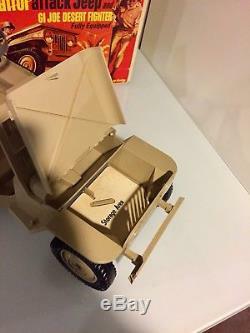 1967 VINTAGE HASBRO GI JOE DESERT PATROL ATTACK JEEP w/BOX 2-FIGURES RAT PATROL. This item is very hard to find with the original box. The box is in pretty good condition for its age but has a couple issues on the front of the box. 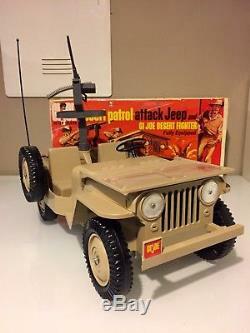 The Jeep is in very good condition and was used for display purposes only. For the most part - it does have one crack in the front bumper and only shows if you separate it - this could be glued by the new owner. The Jeep is pretty close to being 100% complete. Please review my pictures and Ill be more than happy to answer any question you have or send more pictures. 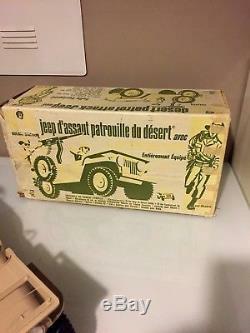 Hard to find Set, in Played With but Very Displayable Condition (see photos). 1967 One Year Only Tan Color Jeep with Spare Tire - No Side Marker Lights (Small Hairline Crack in Right Front Bumper Mount). Tan Windshield Complete Small Crack. Ultra Rare - Hard to Find Vintage Original Radio Antenna. Tan Tri-Pod for Gun Mount. Original Grey Gun Ring - Warped. Original Black Steering Wheel and Mount with Horn Button. 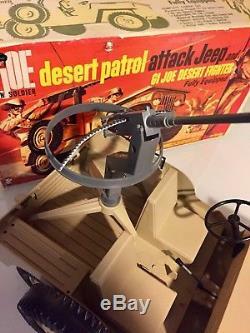 DESERT ATTACK JEEP DRIVER - 1. 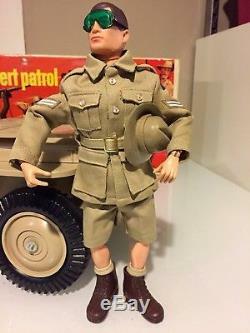 Soft Head Brown Hair Figure SGT Sam Troy - Excellent Figure - Looks Awesome! Super Clean Desert Tunic, Shorts, Tan Socks & Belt w/ Matching Colors - Beautiful. Super Clean Original Campaign Hat. 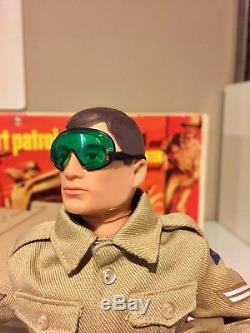 Super Clean Original Green w/ Black Trim Goggles - Original to these sets. Super Clean Correct Original Vintage Short Brown Boots. 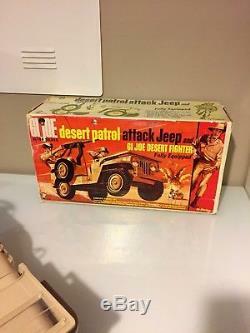 DESERT ATTACK JEEP DRIVER - 2. Soft Head Blonde Hair Figure Tully - Great Soft Head Figure - Looks Awesome! Clean Desert Tunic, Shorts, Tan Socks w/ Matching Colors - Beautiful. Very Clean Original Combat Helmet. Very Clean Original Amber Goggles - Original to these sets... Very Clean Correct Original Vintage Short Brown Boots. 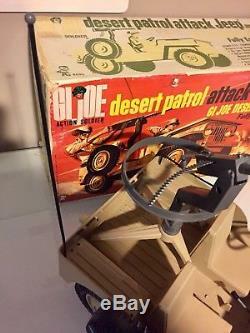 1967 HASBRO GI JOE DESERT ATTACK JEEP BOX. Very Displayable Condition with Bright Graphics... All Flaps Present - Flaws - There is some marks / writing on the box as shown in pictures. 1964, 1965, 1966, 1967, 1968, 1969, 1970, 1971, 1972, 1973, 1974. Super Tough to Find Pieces! Please review pics and ask questions. 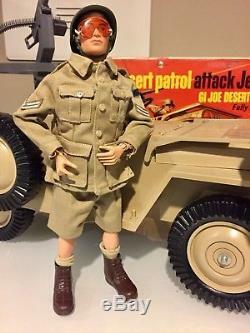 Collecting 1960s Gi Joe, Big Jim and Johnny West... Is Pre-Adventure Team and Post Painted Head Era of Soldiers, Sailors, Marines and Air Force Pilots including Combat, Fatigues, Jumpsuits, Helmets, Hats, Rifles, Scuba, Snow Patrol, Jungle, Desert Patrol Attack, Jeep, Figures, Red, Blonde, Black, Brown, Green Beret, LSO, Astronaut, Space Adventures of Adventurer, Aquanaut and Talking Astronaut with sets like the Fight for Survival, Eight Ropes Danger, Spacewalk Mystery, Mouth of Doom, Fantastic Freefall, Sharks Surprise and Mission to Spy Island some becoming only 1 - Year Runs and others led way to the Popular Adventure Team with new sets like the Flying Space Adventure, Hunt for the White Tiger, Capture of the Pygmy Gorilla and variations of the Fight for Survival, Eight Ropes Danger, Spacewalk Mystery, Mouth of Doom, Fantastic Freefall etc. 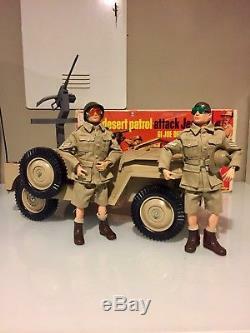 The item "1967 VINTAGE HASBRO GI JOE DESERT PATROL ATTACK JEEP withBOX 2-FIGURES RAT PATROL" is in sale since Wednesday, July 25, 2018. 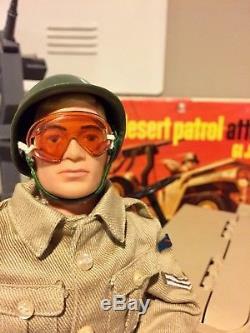 This item is in the category "Toys & Hobbies\Action Figures\Military & Adventure". 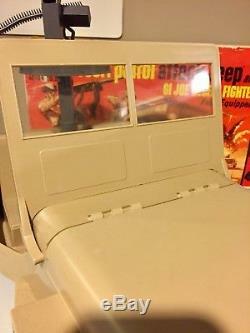 The seller is "actionjoe" and is located in Kitchener, Ontario. This item can be shipped to United States, Canada.